Issawi told An Nahar daily in remarks published Thursday that Bellemare would assess the accuracy of the information provided to him by Hezbollah. The data was later transferred by Mirza to Bellemare’s Beirut office. Meanwhile, An Nahar revealed that Saudi Arabia has paid its remaining share of the second year funding for the tribunal. Hezbollah politburo member Mahmoud Qomati stressed Wednesday the party’s demand for the elimination of the Special Tribunal for Lebanon. He said that Hezbollah handed over its information on the Hariri assassination based on a request from the Lebanese judiciary and not the STL or its Prosecutor Daniel Bellemare. According to local reports the Lebanese cabinet asked yesterday Justice Minister Ibrahim Najjar to follow up with the Lebanese judiciary on the issue of false witnesses of STL and prepare a report on the matter. i mean with all due honesty that even though HAs evidence is questionable, i hope that they gave the tribunal more than just a confession and the intercepted photo. but having said this, i hope that it puts a seed of doubt cos any trial has to do with beyond a reasonable doubt and this photo does put reasonable doubt as to israel’s involvement but not necessarily HAs innocence. 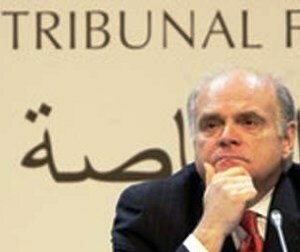 if the STL indicts the HA spies then HA has nothing to worry about cos lebanon will understand where the leak occured. For HA to demand the elimination of the STL clearly shows their hands are not clean. Now let’s face it who had the ability and sophistication to pull that assassination AND all others after Hariri’s but HA’s thugs. Pity HA for they never thought the Syrian regime would sell them out as they did.. Goes to show no one should trust the Syrian tyrant.